In the past few years, we’ve had plenty of news to distract investors from what’s driving the markets. While headlines have been dominated by a constant barrage of social and political news to date, the domestic equity markets have taken their cue from the positive economic environment, broadly rallying during the third quarter. As we’ve seen so frequently since the Global Financial Crisis, domestic large-cap growth led the markets, and much of the gains continue to be driven by the FAANG stocks (Facebook, Amazon, Apple, Netflix and Google). In acknowledgement of a healthy economy, and with almost 10 years separating us from the Global Financial Crisis, the Federal Open Market Committee (FOMC) continued to increase the overnight target federal funds rate and slowly shrink the size of its balance sheet. The target rate (lower bound) now sits at 2%, and the FOMC has increased three times (25 basis points each) this year, with the latest on September 26th. In response to changes in monetary policy and the economy, benchmark U.S. Treasury yields continue to increase. In recent sessions, the 10-year yield has broken above 3% and touched the highest yield level in seven years. To date, this has not weighed on domestic equities, but the strength of the U.S. dollar (partially due to interest-rate differentials versus other currencies) has been a headwind for international investing. As always is the case, there are areas of concern. Housing activity, by just about any measure, has softened in recent months. Mortgage rates are at/near their highest levels since 2011, and housing affordability is at the lowest level since 2008. The good news for housing is that the unemployment rate remains low. The other area of concern is the credit markets—more specifically, the impact of 10 years of ultra-accommodative monetary policy on risk premiums and the knock-on effects of investor behavior when “safe” assets have returned very little for a prolonged period of time. 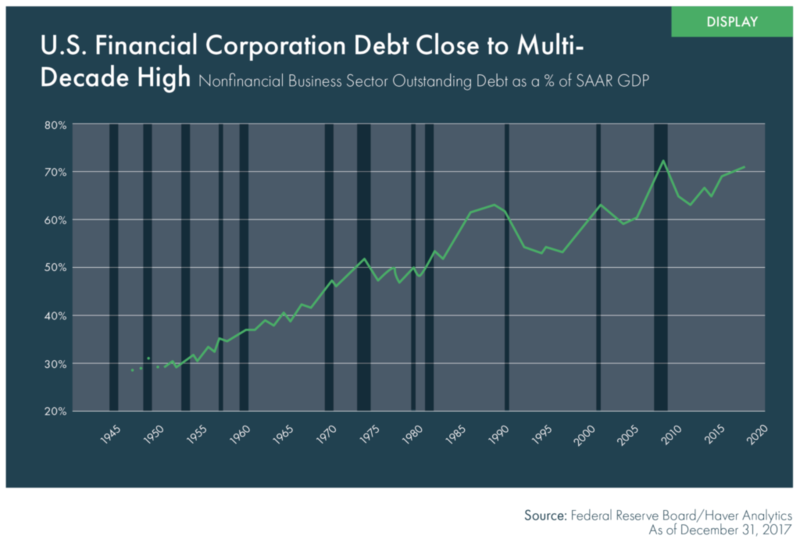 In terms of the credit markets themselves, deficits have increased and are expected to rise more based on the latest tax cuts, and the debt of U.S. financial corporations as a percentage of GDP is near a post-World War II high (Display). The amount of leveraged loans, high-yield bonds (particularly CCC-rated) and BBB-rated bonds (lowest level of investment grade) have all increased dramatically at the same time that quality has deteriorated by most measures. All of this has happened against the backdrop of an extended period of relatively low volatility, positive returns and low, risk-free rates on such things as cash, Treasury bills and CDs. Investors have generally had to step out on the risk curve to generate “adequate” returns, and the credit markets have been very accommodating in raising capital in this environment. The good news is that a strong economy and benign inflation are supportive of the markets, which is the environment in which we currently find ourselves. The aforementioned concerns would be a higher threat level in a weaker economy. First, when the U.S. Federal Reserve (Fed) hits the brakes, reverses course and begins raising interest rates after a protracted easing cycle, usually someone or something goes through the windshield. Food for thought. Second, if risk premiums in credit markets are tight, investor comfort is relatively high and valuations in many sectors are above average, some caution is probably warranted. No one knows when the next market event or correction will happen, but being prudent in one’s asset allocation, disciplined in sticking close to it, and reviewing it periodically to make sure it still is appropriate are activities of a successful investor. A strong U.S. economy continued to drive U.S. stocks higher in the third quarter, leaving U.S. equities well ahead of international markets for the year. 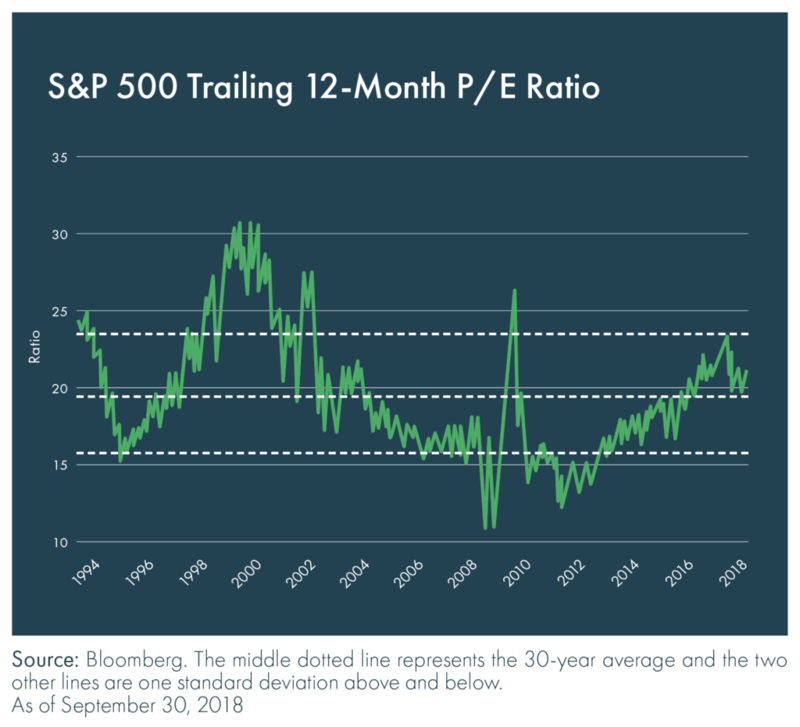 Additionally, this market has shown once again that valuation is a poor metric for market timing as the most expensive parts of the market, relative to their own history, continued to be the strongest. Outside the U.S., relative weakness was once again created by U.S. dollar strength, offsetting the gains in developed markets. Emerging markets were also weakened by trade tensions and export weakness in China. U.S. Treasuries were weak in general as interest rates rose across the board, though the shape of the yield curve continued to flatten. The credit market was the strongest, with both high yield and investment grade benefiting from tightening credit spreads. Economic growth remained robust in the U.S., with employment, wages, consumer confidence and activity in the manufacturing sector all pointing in a positive direction. The Fed implemented its third rate hike of 2018, removing references to “accommodative” policy and striking an overall optimistic tone. The Fed’s economic projections reflected a slightly higher growth forecast with an unchanged inflation outlook and, importantly, expectations for the appropriate long-term level of the fed funds target rate remained near 3%. 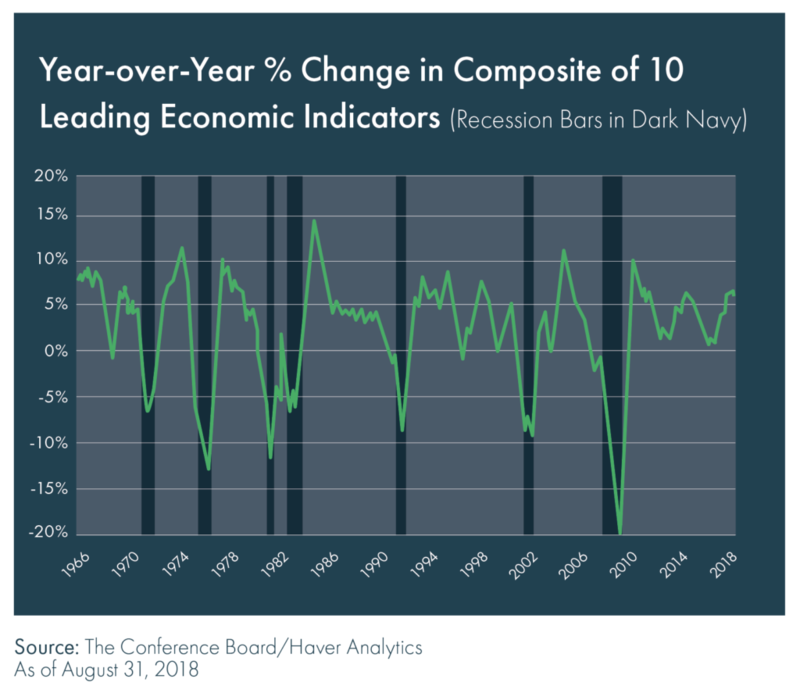 The Conference Board Leading Economic Index (LEI) for the U.S. continued on an upward trend through August, consistent with a solid growth scenario in the second half of 2018. Positive contributions from the Institute for Supply Management (ISM) New Orders Index and the financial components more than offset the negative contributions from building permits and weekly hours in manufacturing. 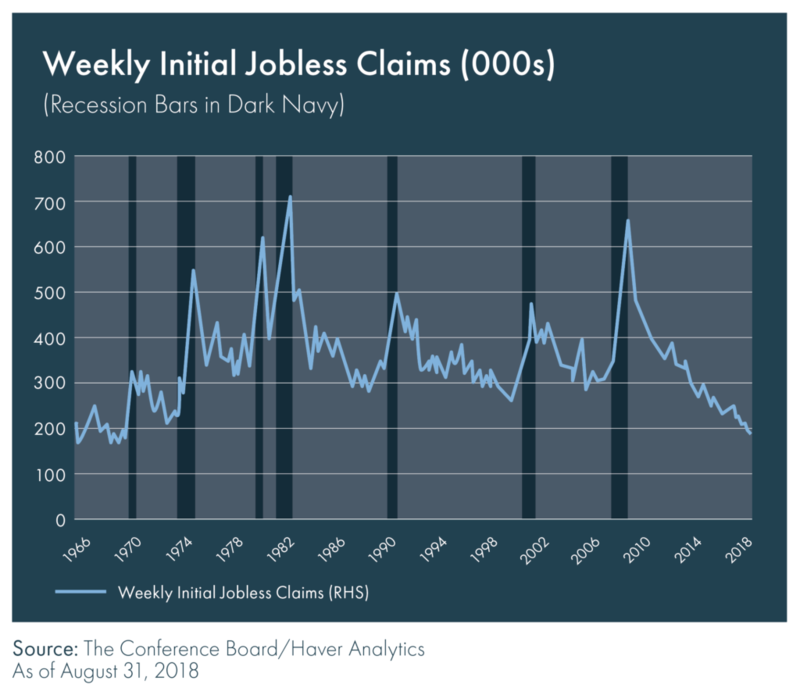 For the period ending August 31, the monthly average of initial jobless claims fell to the lowest level since 1969. U.S. employers added 201,000 jobs in August, and the unemployment rate was unchanged at 3.9%, according to the U.S. Bureau of Labor Statistics’ Employment Situation Report issued in September. With this increase, the economy has added jobs for 95 consecutive months. Average hourly earnings for all employees on private nonfarm payrolls rose by 10 cents in August, and year-over-year hourly earnings increased by 2.9%. Confidence metrics across the board were strong in the third quarter. U.S. consumer confidence reached its highest level since 2000, and the National Federation of Independent Business’s Survey showed that small businesses were at the most optimistic levels since the survey began in 1974. 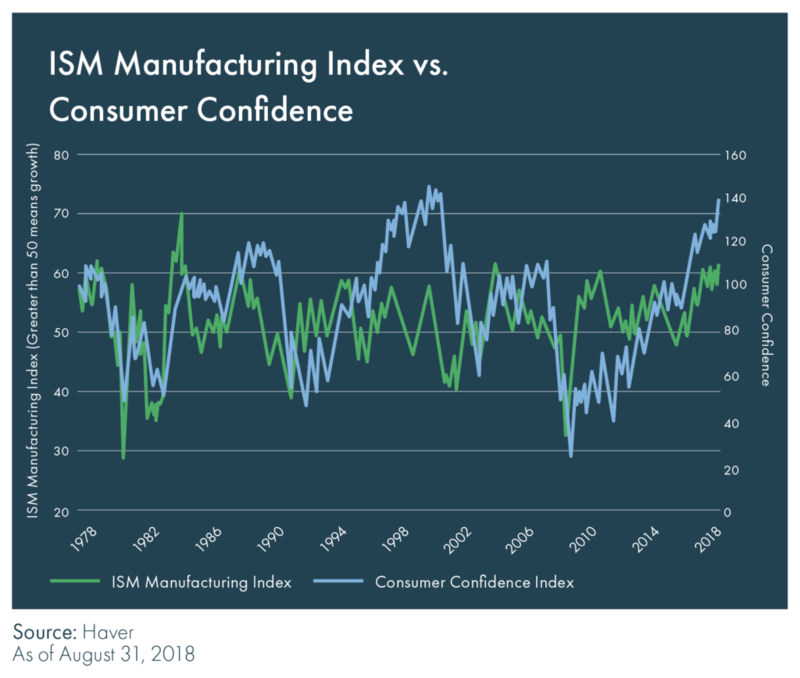 Economic activity in the manufacturing sector continued to expand in September as the overall economy grew for the 113th consecutive month, according to the ISM Report on Business issued October 1. Fifteen of the 18 industries surveyed by the ISM reported growth in new orders in September, led by textile mills, miscellaneous manufacturing, plastics and rubber products, and computer and electronic products. The trailing 12-month P/E ratio for the S&P 500 finished the quarter slightly higher relative to June. Although earnings growth between the first and second quarter slowed, overall growth remains strong as year-over-year earnings growth sits above 20%. While the strong earnings growth remains supportive for stocks, the bar has been set very high as analysts’ year-over-year estimates are currently at 21%, and it could become more difficult for the majority of companies to beat these elevated expectations. U.S. equities significantly outperformed international and emerging-market equities, and U.S. growth companies outperformed value across all market-cap spectrums. Both international and emerging markets suffered from the U.S. dollar’s strength, as local-currency markets were relatively flat. Weakness in emerging markets was also created by a sharp slowdown in exports from China. Sector performance analysis was a little more complicated in the third quarter as Standard & Poor’s completed its realignment of its sectors, changing the telecommunications sector to the communications services sector in September. The new sector combines the telecom companies with select information technology and consumer discretionary companies, which Standard & Poor’s believes better reflects the current communications and information delivery landscape. Given the age of the newly created sector, the historical performance is back-tested and provided by Standard & Poor’s. While telecom companies performed well during the quarter, the newly created communications services sector performed poorly as Facebook, the second-largest company in the sector, collapsed on poor earnings results and news scandals. The strongest-performing sector during the quarter was healthcare, which was led by biotech and pharmaceutical companies. 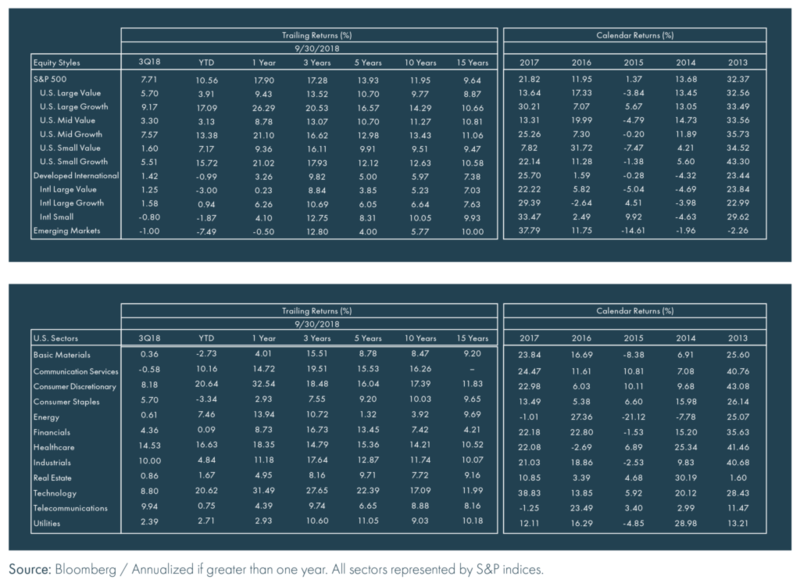 Using our four-factor blend, valuation movement was generally mixed during the quarter and there were not any significant directional changes. 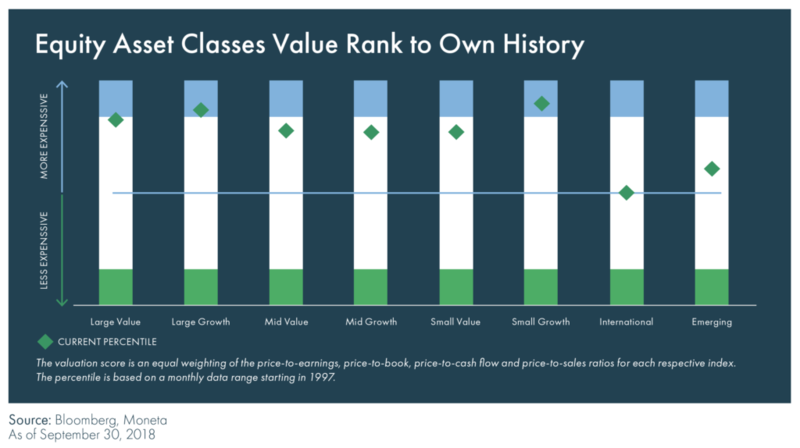 Small growth remains the most expensive relative to its own history, and international markets, both developed and emerging, are significantly cheaper, though still trading at or above their historical averages. Longer-term U.S. Treasuries were the weakest segment of the fixed-income market in the third quarter. Credit-related sectors posted some of the strongest performance of the quarter, the first positive quarterly return for the investment-grade corporate sector this year. Against the backdrop of strong economic growth, rising inflation and rising interest rates in the U.S., high-yield credit has been the strongest performer among fixed-income sectors. Although the U.S. Treasury yield curve shifted upward during the third quarter (rates at all maturities increased), the spread between short-term and long-term rates continued to gradually tighten, falling below the 25-basis-point mark. 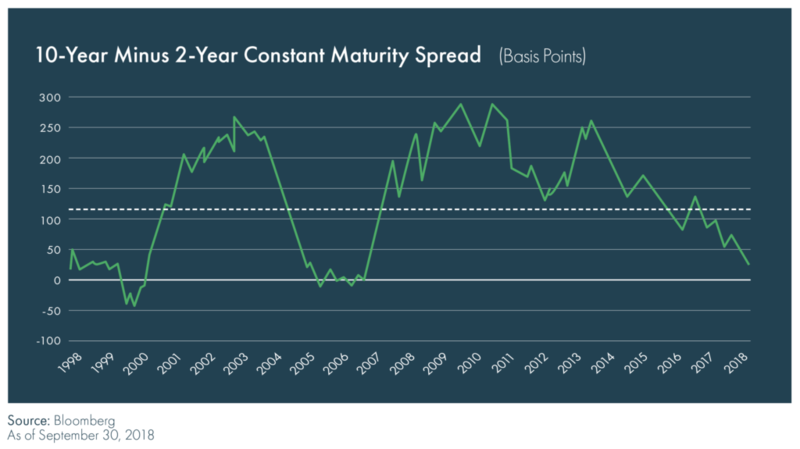 During the third quarter, investment-grade credit spreads returned to their longer-term trend of tightening; however, high-yield spreads have reached their tightest levels since before the Global Financial Crisis.